5800: Radio Playback @ 00.57. SINPO 34343. 6220: Mystery Radio @ 00.52. SINPO 43454. 6220: Mystery Radio @ 20.23. SINPO 54555. Excellent signal ! 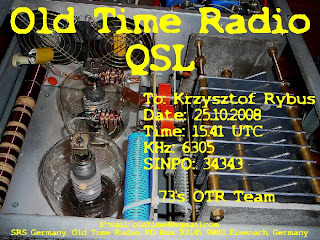 This is a Old Time Radio QSL received today. Many thanks ! 6220: Mystery Radio @ 15.48. SINPO 44444. Strong signal. 6300: DELTA Radio @ 11.29. SINPO 44344. Playing Boney M and later ABBA (at 11.35). 6305: Radio Brandaris @ 09.10. SINPO 34344. Closing down took place at 09.13. 6307: Radio Shadowman @ 10.36. SINPO 54344. Giving ID. Closing down at 10.41. 6311: Radio Double Kilo @ 00.54. SINPO 45444. Playing U2 and saying that it is about to close down at 2.00 CET (actually, the closing down took place at 02.05 CET). 6925 (USB): Spider Radio (tent) @ 20.04. SINPO 34333. Playing U2 "Still haven't find what I am looking for".